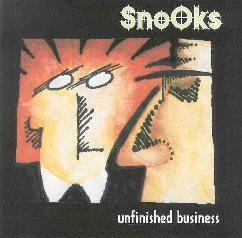 Snooks - "Unfinished Business"/"By Land And By Sea"
Snooks is a transatlantic collaboration between Eric Svensson, aka Doktor Liborius and Jim Shepard. It's a project and a friendship between two musicians that had its roots as early as 1977. Dr. Liborius never met Jim Shepard face to face, and now sadly never will (according to the liner notes, "On November 16th, 1998, James Michael Sheppard checked out from the world as we know it."). But their collaboration was a fruitful one, producing the album Unfinished Business and a series of live recordings (from what I understand, James Shepard would perform live vocals to backing tapes provided by Liborius-on one occasion, "they" opened live for John Cage, apparently baffling the audience!). The music, described as "a Dada Beat experience", is heavily influenced by Frank Zappa, with complex structures, narrative vocals, and all sorts of kooky characters and sound effects. The songs are all short (the longest being 4:40, the shortest being 45 seconds) but run together in a vast collage of strange soundscapes, created mostly electronically, but with the odd bits of guitars, xylophone, and real drums thrown in. As with the live performances, Liborius creates the majority of the music, while Shepard talks, muses, and sings over it, with a vocal style also similar to Frank Zappa's. The CD includes two discs, the second one, By Land and By Sea, being a live disc. 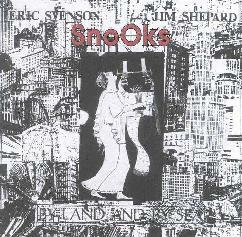 Although the sound of the live recordings isn't of great quality, it is quite listenable, and gives a glimpse into the kind of thing that happened when James Shepard took Liborius' tapes and the Snooks act on the road. For more information you can visit the Mental Telemetry web site at: http://www.planetkc.com/ithomas/intro.html. Contact via snail mail c/o Mental Telemetry; PO Box 46643; Kansas City, MO 64188-6643.